LaserShark™ is a high end 3D laser camera or laser profiler for use on AUVs and ROVs. It has a long range and a wide swath width. Currently LaserShark™ is in a product development phase after completing a reserach project in cooperation with Kongsberg Maritime. 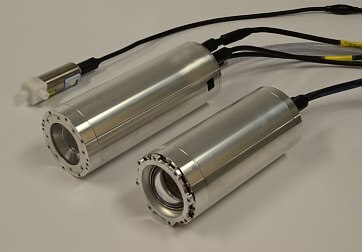 This picture shows the LaserShark™ housings. Camera unit (right), laser unit (middle) and water pump (left). High camera line rate, high "frame rate"
This picture shows the LaserShark laser fan. 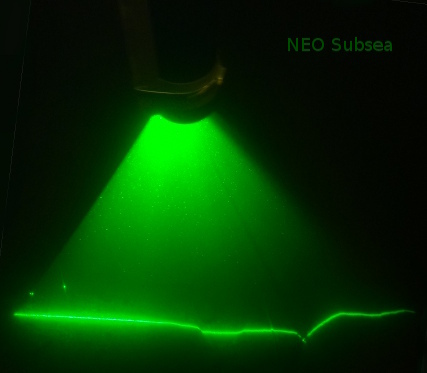 One can see that the seabed has different heights along the laser line. The advance information datasheet for the LaserShark™ system can be downloaded here (pdf-format).